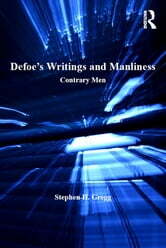 Defoe's Writings and Manliness is a timely intervention in Defoe studies and in the study of masculinity in eighteenth-century literature more generally. Arguing that Defoe's writings insistently returned to the issues of manliness and its contrary, effeminacy, this book reveals how he drew upon a complex and diverse range of discourses through which masculinity was discussed in the period. It is for this reason that this book crosses over and moves between modern paradigms for the analysis of eighteenth-century masculinity to assess Defoe's men. A combination of Defoe's clarity of vision, a spirit of contrariness and a streak of moral didacticism resulted in an idiosyncratic and restless testing of the forces surrounding his period's ideas of manliness. Defoe's men are men, but they are never unproblematically so: they display a contrariness which indicates that a failure of manliness is never very far away.